Enchantment from the robes is called "Skein of Magnus" in the CK, but the robes in the game cannot be disenchanted (unless using a specific mod for that). Another set of Archmage's Robes without the hood and the 50 magicka point bonus exists in the Creation Kit data (formID 0007c932, editor ID ClothesMGRobesArchmage). 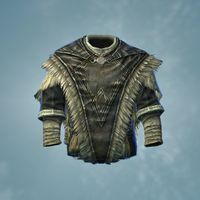 This version of the robes can be found on one of the Heroes of Sovngarde in the Hall of Valor, but Heroes of Sovngarde can't be killed or pickpocketed. One is present in the Arch-Mage's Quarters on a table near the bed, but it is permanently set to 'initially disabled', and thus cannot be obtained. This issue has been addressed by version 2.0.4 of the Unofficial Skyrim Patch; 'Initially disabled' tag has been removed. Although the Archmage's Robes are considered to be hooded, they occupy only the "body" and "hair" body part slots, but not the "circlet" body part slot, unlike most other hooded robes. This means that they can be worn simultaneously with circlets or Dragon Priest Masks. Sometimes you can receive two or even three Archmage's Robes after completing the Eye of Magnus quest. Unlike all other mage robes, an NPC follower whose default apparel is clothing or robes (not armor) will equip the Archmage's Robes if given. ? This page was last modified on 23 March 2019, at 23:44.